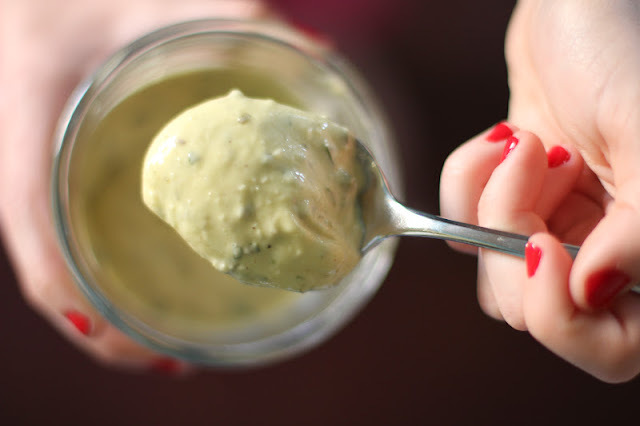 Aïoli is a garlicky homemade mayonnaise. 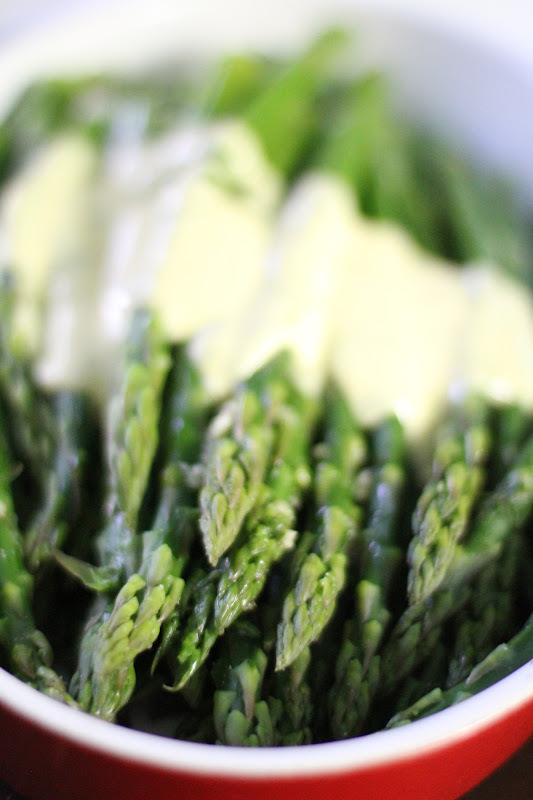 If you like garlic and you like mayonnaise, you will adore aïoli. I especially like this aïoli as a dipping sauce for artichokes and french fries or as a tasty spread slathered on sandwiches. If you add to the recipe a little sweet pickle relish, tarragon and finely minced shallot you would have.... ta da... tartar sauce. Tartar sauce, as we all know, is a flavorful emellishment to crab cakes and any freshly prepared fish whether grilled, baked or fried. I feel that this recipe is a hybrid between aïoli and tartar sauce. The final result is definitely garlicky, but there is the herbal note, too. I used tarragon flavored Dijon mustard from France, although I think freshly minced tarragon would be lovely added with the minced parsley (if you use traditional Dijon). Fresh dill would be a great alternative or addition in the herbal department. Steamed asparagus sauced with aïoli. 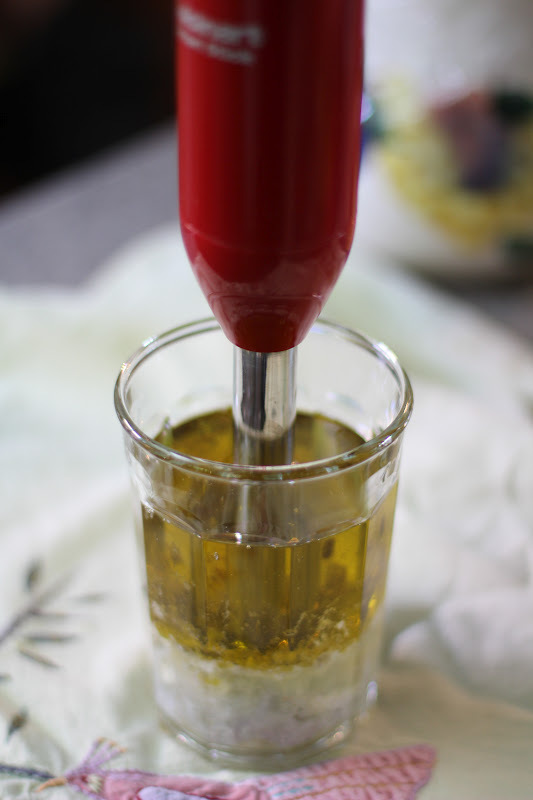 The traditional way to make aïoli, or mayonnaise for that matter, is to make an emulsion by slowly (and patiently) adding - drip by drip - approximately one cup of neutral flavored oil into one or two egg yolks or a whole egg, along with mustard, lemon juice and seasonings. The emulsion has been made for centuries by using a fork, a wooden spoon, or mortar and pestle. If I may be so bold: to heck with tradition, this is an example of where a gadget trumps convention. Linda and I are enthusiastic viewers of Everyday Exotic on the Food Network. On the "obedient ingredient" episode for Lime Leaf, the affable host, Roger Mooking whipped up a Lime Mayo by placing all the ingredients in a tall container and blending with a stick blender. Roger produced perfect mayonnaise in about 10 seconds. My jaw hit the floor and then I hooted. Really, I did. That's one small step for Roger, one giant leap for cooks everywhere. Farewell patience, hello instant gratifcation. I've been making mayo and aïoli in a jiffy ever since using my favorite Cuisinart SmartStick hand blender. 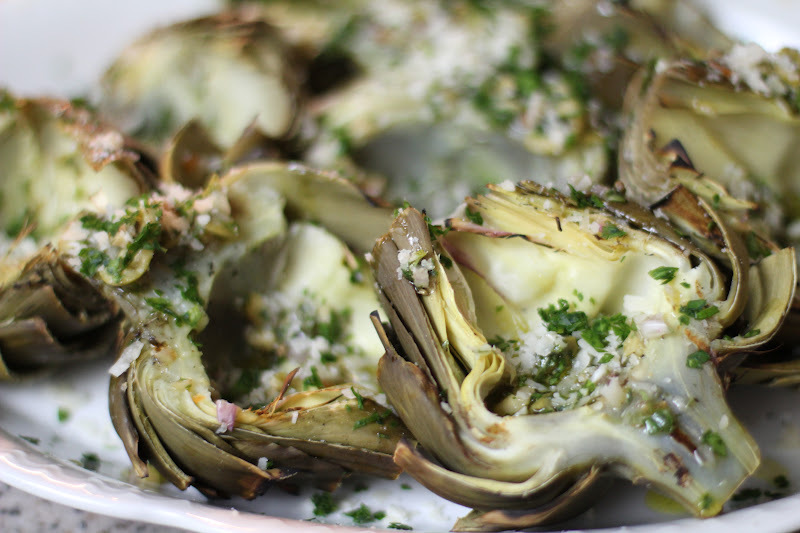 Believe me when I say that artichokes pair perfectly with aïoli as a dipping sauce. You can make this sauce in any deep container. For ease in preparation, I prefer to use a large 21-ounce French Working Glass. Purchase the working glass with the matching plastic lid for a tight seal, which will keep your aïoli fresh for about one week when stored in the refrigerator. This recipe is adapted from Paleo Comfort Foods by Julie and Charles Mayfield (Victory Belt Publishing Inc. ©2011). In particular, what makes this recipe Paleo is the exclusion of seed oils. The avocado's green pulp is expressed to make the oil. The avocado oil is mild and offsets the more assertive flavor of olive oil. If you quickly need to bring a cold egg to room temperature, in a medium bowl cover the whole egg with tepid tap water and let sit for about 10 minutes before proceeding with the recipe. 1. Put all the ingredients from the egg through the black pepper into the Working Glass, or other similar jar/beaker. 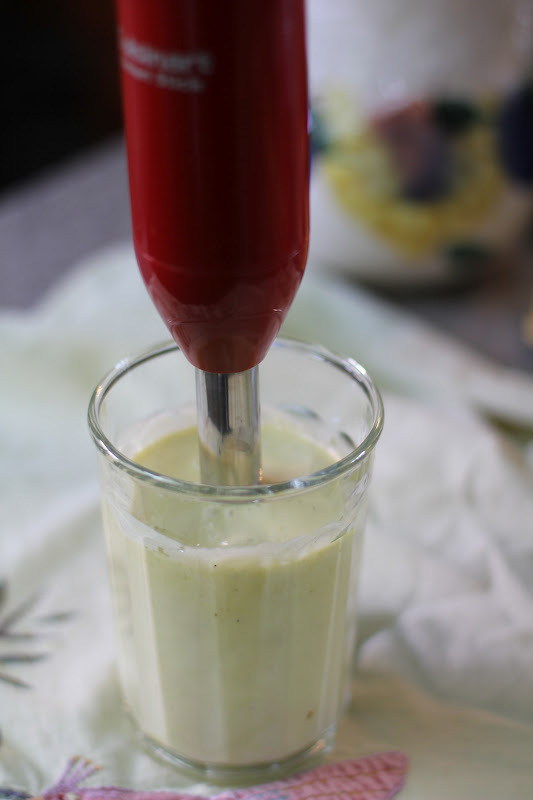 Blend the ingredients with the immersion blender until emulsified, about 10 seconds. 2. If desired, add capers and flat leaf parsley. Stir. 3. Keeps well, covered and refrigerated, for about a week.